Where *app name* is the name of your Social Sign-In Integration App configured to login to WHMCS with Facebook, and *website* is your website address. 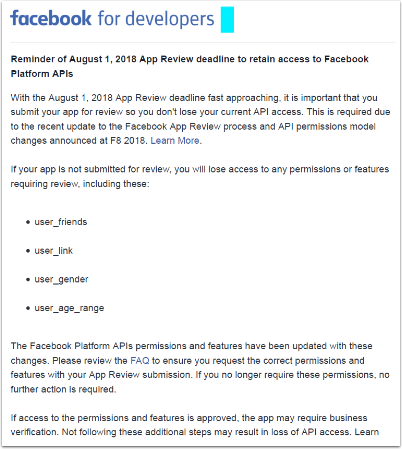 The email speaks of an App Review deadline to retain access to Facebook Platform APIs. Access to certain permissions and features of the Facebook API now require inspection and approval by the Facebook platform moderators. The email is reminding you of this fact. The Sign-In Integration used by WHMCS does not require these permissions. WHMCS does not require access to the permissions or features of the Facebook API which presently require approval. Therefore no action is required on your part. These emails can be safely ignored. These permissions are not currently subject to Facebook's review requirements, so you can continue to use your Facebook app without subjecting it to the approval process.